Giotto’s famous fourteenth century painting of Pilate [view it here] is an intriguing departure from the popular interpretation of the Governor of Judea as culturally reflected and embedded by the musical Jesus Christ Superstar. Rather than the amoral dandy of Broadway who sacrifices Christ to the executioners to preserve Pax Romana in Judea and his political career, Giotto arguably portrays a man whose sad grey eyes and pursed lips, though revealing traces of cruelty and sensuality, announce his portentous conclusion that he has done something deeply wrong in sentencing Christ. Are the Gospels Accurate in Their Presentation of Pontius Pilate? Of course, no one knows what Pilate looked like and Giotto’s painting is the consequence of an artist’s imagination filling that gap. What is of greater importance than Pilate’s physical appearance to the Christian apologist defending the historical status of the Gospels is that the Gospels’ accounts of how Pilate and the Jerusalem mob behaved at Christ’s trial are consistent with each other and conform to what is known extra-biblically regarding Roman justice and the turbulent relationship that existed between Pilate and his resentful imperial subjects. Moreover, it is possible to demonstrate that the Gospels’ congruous testimony regarding Pilate’s existence is supported by the testimony of the available archaeological evidence as well as of extra-biblical written sources whose writers, if anything, were hostile to Christianity and had no reason to aid its survival. That Pilate can be shown to have lived is part of the broader project of demonstrating that the Gospel narratives speak of historical personages and therefore cannot be treated, on that point at least, as layers of myth. With regards to the specific details of Pilate’s broader career and character, something is known, though not with complete certitude. The details of Pilate’s life after he was deposed as procurator in AD 36 are, however, putative, for at this point the historian runs into an obfuscating wall of subjective narratives. The Synoptic Gospels and the Johannine Gospel are consistent in their presentation of Pilate and the events in which he was caught up and failed to control. However, the Synoptics devote less textual space to Pilate than John’s Gospel where Pilate is depicted through John’s characteristically long dialogues in arguably the most sympathetic of the Gospels’ presentments. Twice Pilate is recorded as interrogating Christ: the first time his tone appears sarcastic and condescending, particularly when he attempts to catch Christ out with the question, what is truth? (John 18:38). The second interview shows Pilate afraid and genuinely curious, for he has heard from Christ’s accusers that Christ claims to be the Son of God (19:8). When he presents Christ to the crowd, he describes Christ as their king with perhaps genuine conviction (19:14). It is conceivable that John is hinting that Pilate saw in Christ something unusual that the Sanhedrin and their allies could not, or would not, but which his polytheistic and syncretistic Roman mind could not quite understand. It is Christ’s innocence coupled with the sense of Christ’s uniqueness that accounts for the procurator’s repeated, but vain, attempts to exonerate this most exceptional of prisoners and his benign assent to Joseph of Arimathea’s request to give Christ a decent burial rather than leave his body to decompose on the cross (John 19:12; Matthew 27:57-58; Mark 15:43-46; Luke 23:50-54). However, the differences between the Synoptic Gospels and John’s Gospel’s account of Pilate’s actions are nuances of focus and style rather than contradictions. It is therefore possible to provide an outline of the information the Gospels commonly furnish as follows: Christ is sent by the Jewish High Council to Pilate for trial on the mendacious charge of lèse majesté. Pilate interrogates Christ, finds him not guilty and tries to persuade the crowd that he should be released. The crowd adamantly refuses, so Pilate, to pacify them, has Christ flogged and then crucified (Matthew 27:11-26; Mark 15:2-15; Luke 23:2-3, 18-25; John 18:29-19:16). Both Matthew and John give Pilate the title of governor or hēgēmon which is used to refer to the Roman procurators (Matthew 27:11; John 18:28). Historians inform us that a governor or procurator’s role was to govern a conquered region on behalf of the Emperor. To do so, the procurator possessed the powers of full imperium which meant that he possessed criminal and jurisdictional authority, military power and the authority to raise taxes to ensure that revenue from the province flowed back to the imperial coffers. As supreme magistrate for the region, he alone held the prerogative of passing the death sentence. The Gospels’ accounts of the Sanhedrin’s sending Christ to Pilate to secure his execution and the demands made directly to Pilate by the mob for Christ’s execution are therefore consistent with historical knowledge (Matthew 27:20; Mark 15:11-15; Luke 23:13-23; John 18:31). Military experience would have constituted an important part of Pilate’s curriculum vitae, for procurators were appointed to turbulent provinces. Judea was certainly such a province as the Jews were renowned for their strong sense of divine destiny and therefore were deeply resentful of foreign occupation. Nationalists and their renegade prophets capable of stirring up revolution and the banditry endemic to the countryside made wise, firm government necessary – something of which not all the governors sent by Rome were capable. Within such a context of violent nationalism, the charge made against Christ to Pilate that he had incited rebellion against Rome was, as the Sanhedrin well knew, a dangerous and effective one, and again accords with what historians know of first century Palestine (Luke 23:13,14). If the Gospels agree that Pilate was an historical figure and their presentation of him is consistent with history’s understanding of the procurator’s role and the nature of Judean politics, is there any further evidence outside of the Bible that will substantiate the Gospels’ narratives? Fortunately there is and as stated earlier, the evidence comes in two forms: literary and archaeological. The extra-biblical literary evidence for Pilate is found in the writings of Tacitus the Roman historian, Josephus the Jewish historian and Philo of Alexandria. Tacitus verifies that Christ was executed during the reign of Tiberius by the procurator Pilate. Josephus, whose hostility to Pilate as an oppressor of his Jewish fellow countrymen needs to be borne in mind when using him as a source, presents the details of two of Pilate’s infamous acts, one of religious insensitivity, the other of downright brutality, in the Jewish Antiquities. The first incident related to Jewish outrage over what they perceived to be Rome’s idolatrous depiction of the Emperor. In Josephus’ own words: (55) But now Pilate, the procurator of Judea, removed the army from Caesarea to Jerusalem, to take their winter quarters there, in order to abolish the Jewish laws. So he introduced Caesar’s effigies, which were upon the ensigns, and brought them into the city; whereas our law forbids us the very making of images; (56) on which account the former procurators were accustomed to make their entry into the city with such ensigns as had not those ornaments. Pilate was the first who brought those images to Jerusalem, and set them up there; which was done without the knowledge of the people, because it was done in the nighttime. Pilate, according to Josephus, was forced to remove the images when the Jews refused to disperse and bared their naked necks before the legionaries’ drawn swords stating they preferred death to the transgression of their laws regarding the prohibition of sacred images. The second incident related to Pilate’s use of sacred money for a civil project. Again, Josephus provides the details:(60) But Pilate undertook to bring a current of water to Jerusalem, and did it with the sacred money, and derived the origin of the stream from the distance of two hundred furlongs. However, the Jews were not pleased with what had been done; and many ten thousands of the people got together, and made a clamour against him, and insisted that he should leave off that design. Some of them also used reproaches, and abused the man, as crowds of such people usually do. Pilate’s response this time was not to capitulate to the Jews’ demands, but to order his troops to attack them with daggers with the consequence that the rebellion was crushed with many fatal casualties. Philo testifies to another insult to Jewish religious sensibilities over idolatry on the part of Pilate. In honour of the Emperor, Pilate had dedicated some shields in Herod’s palace bearing the donor’s inscription and the Emperor’s name. The Jews petitioned Tiberius, the Emperor, who being pragmatically concerned with peace in that province, ordered the shields to be tactfully removed to Caesarea. All three episodes reveal common denominators in Pilate’s approach to his Jewish subjects: an inability, or lack of desire, to understand the nature of Judaism with its abhorrence of sacred images and the centrality of the temple, and a willingness to use violence when he could do so, or thought he could do so, with impunity. The three episodes also demonstrate important parallels with the four Gospel accounts of Christ’s trial before Pilate which reinforce the assertion that the Gospels are historically trustworthy. Josephus, as we have seen, records crowds appealing directly to Pilate over a contentious matter. According to all four Gospels, it is a crowd led by the Sanhedrin that assembles before the praetorium in Jerusalem to appeal directly to Pilate for Christ to be executed (Matthew 27:17; Mark 15:8; Luke 23:1; John 18:28). Philo’s record of the Jews complaining over Pilate’s head to Caesar about Pilate substantiates the Gospel of John’s record of the Jews’ threat that Pilate’s failure to execute Christ for claiming to be a king will reach Emperor Tiberius’ ears (John 19:12). This in turn explains why all the Gospel writers record that though Pilate saw Christ as innocent and tried to absolve him, he was intimidated by the crowd that not only could appeal against his decision, but could also riot (Matthew 27:24; Mark 15:15; Luke 23:23; John 19:15-16). 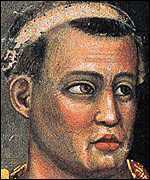 With a track record of mistakes in his handling of the Jews, Pilate could ill afford another diplomatic incident. The text The Acts of Pontius Pilate is referred to by Justin Martyr in AD 150 and by Tertullian in about AD 200. According to Justin Martyr, details of the crucifixion and Christ’s miracles can be found in this document. However, the Acts have never been found. The fact that this purportedly official document names Pilate may be significant to the proposition that Pilate existed, but whether the document has any other historical value cannot readily be ascertained in its absence. Line three: (Praef) ectus Iuda (Eae). Further archaeological evidence for Pilate’s existence is a handful of bronze coins struck by him sometime between AD 29 and AD 32. What became of Pilate? Unfortunately, his encounter with Christ left him an unchanged man. According to Josephus, Pilate’s contempt for his subjects and his readiness to resort to force that threatened the precarious stability of Judea led him to disperse violently a Samaritan mob that had gathered to hear a prophetic demagogue preach on Mount Gerizim. It was one mistake too far. The outcry from the Samaritans was so great that the legate of Syria, Vitellius, intervened and deposed Pilate in AD 36. Jesus Christ Superstar is a rock opera written by Andrew Lloyd Weber and Tim Rice about the last week of Christ’s life. It portrays Christ as a man rather than as an incarnation of the divine. Hence, the crucifixion is shown, but not the resurrection. It was first performed on Broadway in 1971 and made into a film in 1973. The view that the Gospels are mythic layers that reveal nothing about the real Jesus is presented in its most extreme from by Rudolf Bultmann who agued that what was important was not whether anything could be known about Jesus, but that Jesus existed. Bultmann’s view is that the New Testament myths, such as the resurrection, should be reinterpreted into 20th century categories so that people might understand them. In this, he is following a Heideggerian philosophy. W.E. Vine, Merrill F. Unger and William White, Jr., Vine’s Complete Expository Dictionary: Old and New Testament Words (Nashville: Thomas Nelson, 1984), p.276. Ben Witherington III, New Testament History: A Narrative Account (Grand Rapids: Baker Academic, 2001), p.152. Tacitus, Annals 15:44, in Josh McDowell’s The New Evidence that Demands a Verdict (Nashville: Thomas Nelson, 1999), p.55. Josephus, Antiquities 18:55, 56 in William Whiston (trans.) The New Complete Works of Josephus, (Grand Rapids: Kregel Publications, 1999) p.590. Josephus repeats the details of Pilate’s outrage in The Jewish War 2:169-174. Josephus, Antiquities 18:60, 61 in Whiston (trans.) The New Complete Works of Josephus, p.590. Josephus repeats the details of this episode in The Jewish War 2:175-177. Philo, Legatio ad Caium, 38, in Pontius Pilate-Definition, www.wordiq.com/definition/Pontius_Pilate (last accessed 21st December 2010). Bo Reicke, The New Testament Era: The World of the Bible from 500 B.C. to A.D. 100, David E. Green (trans.) (London: Adam & Charles Black, 1969).